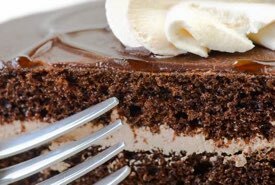 This chocolate Mousse Cake Recipe is so easy to make from scratch, yet it makes a dessert cake having the appearance of being very decadent. 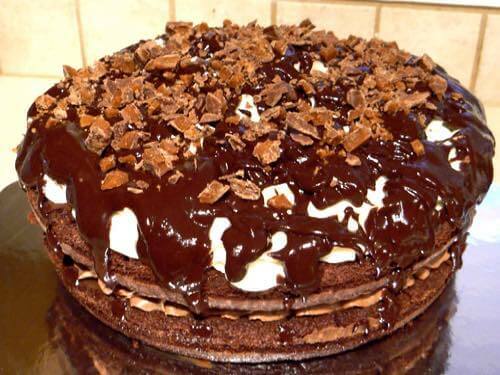 The dessert consists of a chocolate cake base and chocolate mousse filling. 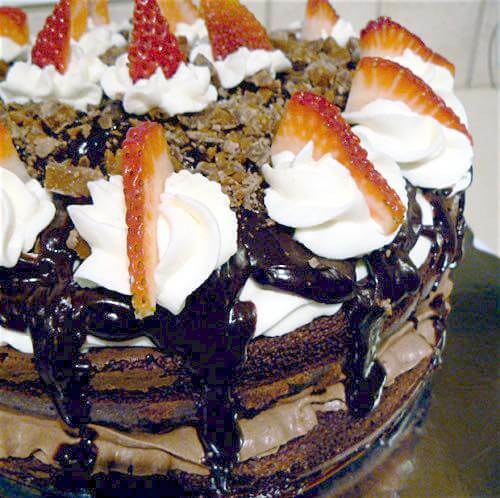 Then it's topped with fluffy whipped cream, rich chocolate ganache, crumbled Skor® bars, and garnished with strawberries. Yummy! 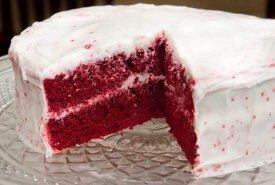 You'll need one 9-inch round chocolate cake, cooled and cut into 2 layers; or, a couple of 9-inch cakes, if you prefer a thicker layer cake for more servings. 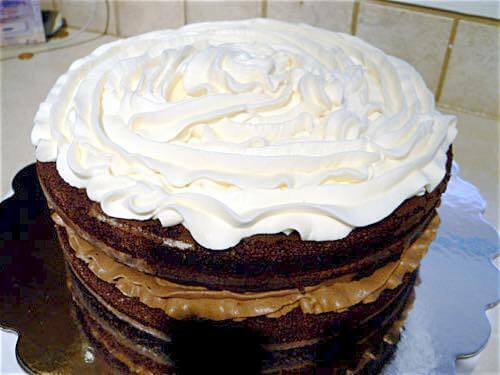 Place your first cake layer on a cake board or plate and top with the chocolate mousse. Add the next cake layer and top with the whipped cream, making sure you set aside enough whipped cream for the piped decoration on top. Spoon some of the chocolate ganache over the whipped cream after first making sure your ganache is not too warm, or it will melt your whipped cream. 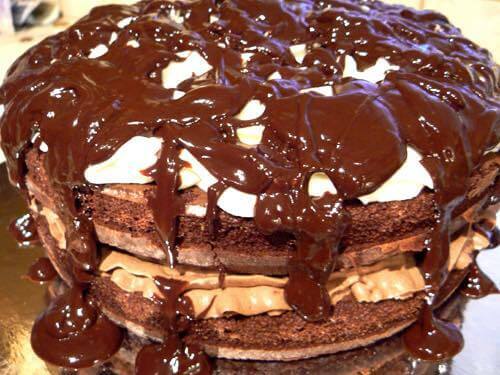 Then simply spoon and drizzle the ganache all over the cake, letting it drip and trickle down the sides. 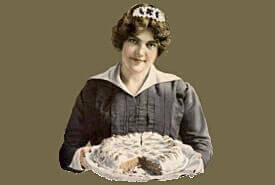 Don't worry if it gets a bit messy looking, as you can always wipe your cake board with a cloth later before serving. Next, chill your Skor® (or Crispy Crunch®) bars in the refrigerator, then place them in a plastic bag and crumble them into small pieces by gently tapping them with a hammer or the bottom end of a bottle. 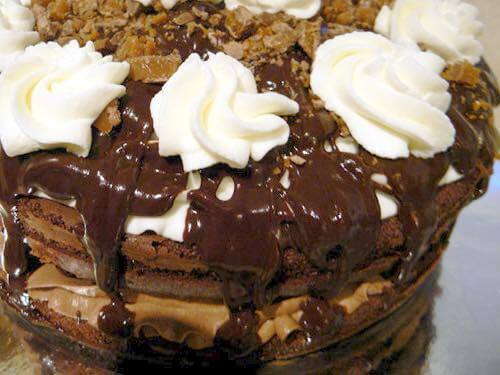 Sprinkle the chocolate bar pieces randomly across the top of your cake. Pipe several whipped cream rosettes around the top edge of your cake, or you can make a large rosette swirl in the center. There's really no right or wrong way to decorate your cake, so just be creative and have fun. Finally, garnish with sliced strawberries, raspberries, maraschino cherries, or another colorful fruit, if you wish. 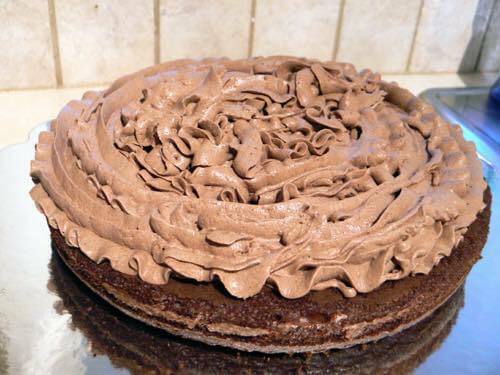 Enjoy making this Chocolate Mousse Cake recipe. You'll be proud to serve this decadent dessert to your friends and family. This chocolate mousse recipe is simpler to make than most. Your decadent mousse will taste so chocolaty good, yet it doesn't contain eggs nor is it complicated to make. 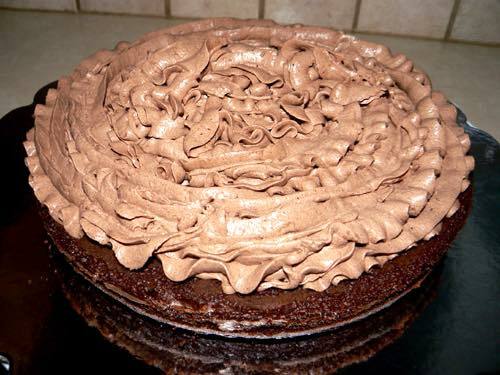 It is totally delicious when used with the homemade Chocolate Mousse Cake recipe above or as a dessert served on its own. Chill your mixing bowl and beaters for about 20 minutes. 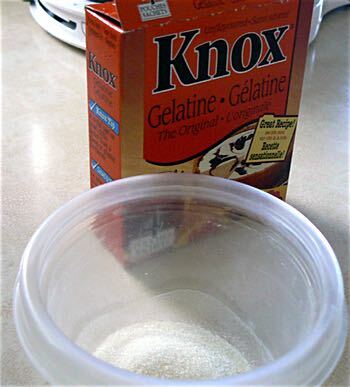 In a small bowl or cup, mix the gelatin powder and boiling water thoroughly with a spoon, and then set aside. Place the whipping cream in your mixing bowl and beat until peaks start to form. Add the sugar, cocoa, and vanilla, and continue beating until stiff peaks form. Then, stir in the gelatin, and place the finished mousse in your refrigerator to set for about 1 hour. Serve as a dessert with whipped cream or use it as a delicious cake filling or topping. 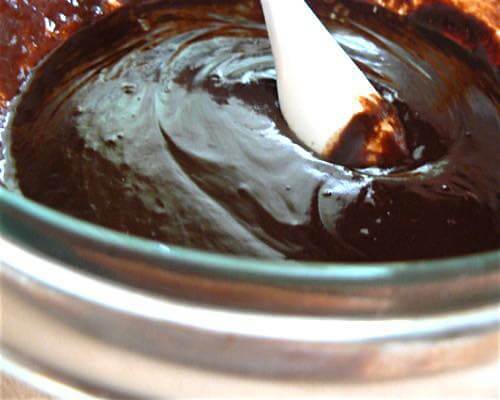 Here's how to make homemade ganache the easy way. You'll love its decadent taste, yet it's a much creamier ganache than most, so feel free to adjust the quantity of chocolate to match your preference. It's the perfect ganache to use with the Chocolate Mousse Cake recipe above. And, it's also delicious as a topping on your favorite ice cream. 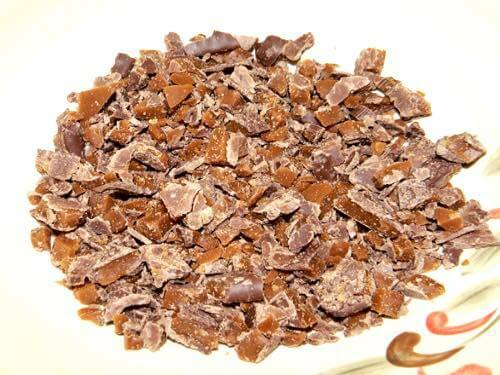 Break the chocolate squares into small pieces and place them in a double boiler to melt, while stirring occasionally as the chocolate softens. A heatproof bowl set in the opening of a saucepan will serve as a double boiler in a pinch. Simmer about an inch of water in the saucepan, making sure the water does not touch the bottom of the bowl. You may add a few chocolate chips if you don't have enough baking squares. If you prefer to use all chocolate chips instead of squares, you'll need 1 cupful. Now add the heavy cream to the melted chocolate and heat for about 2 minutes while stirring. 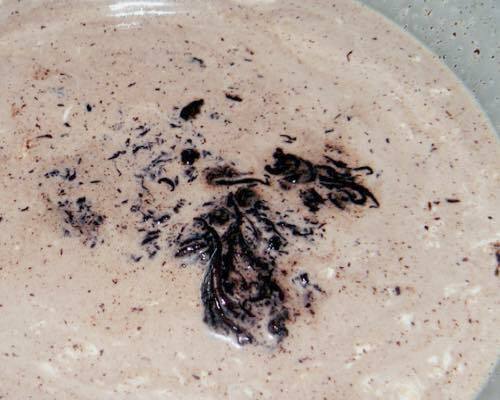 If the chocolate hasn't completely blended with the cream, continue heating and stirring the mixture for another minute or so. You'll know your ganache is ready when the chocolate and cream are thoroughly combined, and you have a smooth mixture that's easy to pour. Use your ganache immediately or store it in the refrigerator for later and reheat it to get the perfect consistency required for use as a topping. Skor® bars were first produced and sold by The Hershey Company in 1981. Skor is Swedish for shoes, and the bar consists of a crispy butter toffee center covered in milk chocolate. They are popular everywhere. Canadians can substitute Crispy Crunch bars, a Canadian favorite since 1923. Invented by a Neilson® employee in 1912, these Canadian chocolate bars are made by Cadbury® and feature a crunchy, flaky, peanut layered center covered in milk chocolate. Apologies to our American friends, but they are not sold in the United States. 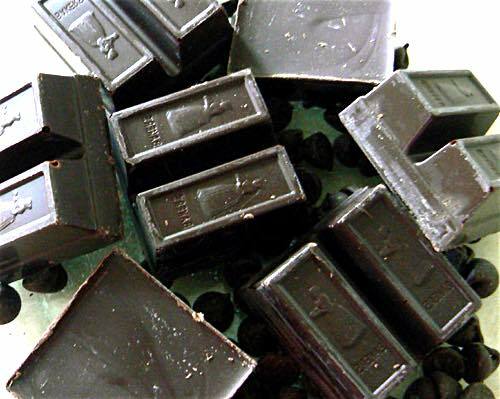 Either of the above bars is delicious when used as a crumbled topping in the Chocolate Mousse Cake recipe.